Thermoplastic polyolefin comes under the thermoplastic elastomer family. It is known for its amazing properties of elastic and plastic. Thermoplastic polyolefin is extensively used in automotive parts, roofing membranes, recreation work, and construction work. Increasing building and construction activities, growing automotive industry, and rising demand for footwear are the factors driving the global thermoplastic polyolefin market. Along with these, rising innovation in plastic technologies, and strict regulations against carbon emission are also fueling the global thermoplastic polyolefin market. Thermoplastic polyolefin exhibits excellent properties such as high melting point, and strength. Such properties allows it to be extensively used in plastic films, geomembranes, and bags. Such USPs are also boosting the global thermoplastic polyolefin market. 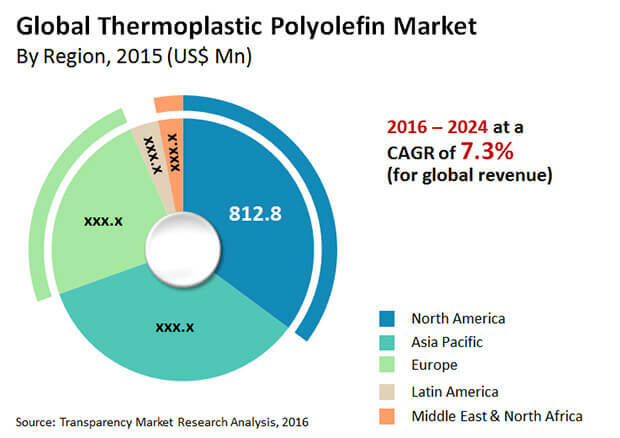 According to experts, the global thermoplastic polyolefin market is expected to hit US$4.3bn by the end of 2024. The growth is expected to occur at an impressive CAGR of 7.3% during the forecast period from 2016 to 2024. The market is mainly segmented on the basis of end-user and geography. From the perspective of end-user, the global thermoplastic polyolefin market is segmented into building and construction, automotive, medical, home appliances, footwear, and industrial. Among these end-users, automotive sector is expected to showcase fantastic expansion in the next few years, especially during the mentioned forecast period -2016 to 2024. This is because of the extensive use of thermoplastic polyolefin in manufacturing automotive components such as door panels, bumpers, dashboard skins, trims, and instrument panels. Such automotive components produced from thermoplastic polyolefin offer outstanding durability and mostly lighter in weight. Growing demand for lightweight automotive materials, and rising automotive industry are expected to fuel the growth in global thermoplastic polyolefin market during mentioned period. Building and construction industry in the thermoplastic polyolefin market is expected to witness next highest proliferation thanks to the increasing use of thermoplastic polyolefin in the production of door panels and roofing membranes in such industries. Thermoplastic polyolefin exhibits outstanding UV-resistant properties, thus it is a preferred choice in making roofing membranes. However, in high-end markets such as North America and Europe, the popularity of thermoplastic polyolefin in manufacturing roofing membranes is expected to continue. This could make the building and construction segment maintain its winning position during the forecast period. Thermoplastic polyolefin is also widely used in jacketing and insulation of cables and wires. Geographically, the global thermoplastic polyolefin market is segmented into North America, Asia Pacific, the Middle East and Africa, and Europe. In 2015, North America held a leading position in the market, mainly due to the rapid establishment building and construction industries in this region. As said, this region is expected to continue its reign in the global thermoplastic polyolefin market. However, rising automotive industry and growing commercial construction activities in Asia pacific is also expected to boost the global thermoplastic polyolefin market during the forecast period. A competitive vendor landscape exists in this market thanks to the presence of innumerable players. Some of the prominent players operating in the global thermoplastic polyolefin market are Mitushi Chemicals, Borealis AG, Chevron Phillips Chemical Company, Exxon Mobil Corporation. TPO, a light weight material, is a major product in thermoplastic elastomers family. It has one of the lowest specific gravities among all the thermoplastic elastomers. TPO is widely used in automotive interior and exterior components. It is employed in automotive bumpers, dashboard skins, door panels, and instrument panels. TPO is extensively used in the production of roofing membrane systems and door panels in the building & construction industry. It is also used in various end-users such as home appliances, medical, industrial, footwear, and rubber goods. The report estimates and forecasts the TPO market on the global, regional, and country levels. The study provides forecast between 2016 and 2024 based on volume (tons) and revenue (US$ Mn) with 2015 as the base year. The report comprises an exhaustive value chain analysis for each of the product segments. It provides a comprehensive view of the market. Value chain analysis also offers detailed information about value addition at each stage. The study includes drivers and restraints for the TPO market along with their impact on demand during the forecast period. The study also provides key market indicators affecting the growth of the market. The report analyzes opportunities in the TPO market on the global and regional level. Drivers, restraints, and opportunities mentioned in the report are justified through quantitative and qualitative data. These have been verified through primary and secondary resources. Furthermore, the report analyzes substitute analysis of TPO and global average price trend analysis. The report includes Porter’s Five Forces Model to determine the degree of competition in the TPO market. It comprises qualitative write-up on market attractiveness analysis, wherein end-users and countries have been analyzed based on attractiveness for each region. Growth rate, market size, raw material availability, profit margin, impact strength, technology, competition, and other factors (such as environmental and legal) have been evaluated in order to derive the general attractiveness of the market. The report comprises price trend analysis for TPO between 2016 and 2024. The study provides comprehensive view of the TPO market by dividing it into end-user and geography. The TPO market has been segmented into automotive, building & construction, home appliances, medical, industrial, footwear, and others. End-user segments have been analyzed based on historic, present, and future trends. Regional segmentation includes the current and forecast demand for TPO in North America, Europe, Asia Pacific, Latin America, and Middle East & Africa (MEA). Additionally, the report comprises country-level analysis in terms of volume and revenue for end-user segments. Key countries such as the U.S., France, Germany, Italy, the U.K., China, India, Japan, South Africa, Mexico, and Brazil have been included in the study. Market segmentation includes demand for individual end-users in all the regions and countries. The report covers detailed competitive outlook that includes market share and profiles of key players operating in the global market. Major players profiled in the report include Lyondell Basell Industries Holding B.V., Exxon Mobil Corporation, Mitsui Chemicals, Inc., Borealis AG, Mitsubishi Chemical Holding Corporation, Chevron Phillips Chemical Company LLC, PolyOne Corporation, A.Schulman, and INEOS Group Limited. Company profiles include attributes such as company overview, number of employees, brand overview, key competitors, business overview, business strategies, recent/key developments, acquisitions, and financial overview (wherever applicable).